The world famous vanish and reproduction of a silk! 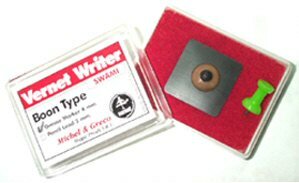 Known as Nail Writers or Swami this gimmick is the most powerful tool a magician or mentalist can use. It’s really very difficult to believe that with such a little and cheap gimmick you can produce the quantity and quality of effects that look like real miracles. With Vernet Writers you can write letters numbers check marks etc. surreptitiously in front of the audience giving the impression it was written before the effect or event. It gives you lots of possibilities.This is the ” VERNET WRITER THUMB TIP TYPE – Grease Marker – China Marker 4mm”: The same but with this lead (Listo Pencil) the writing can be seen even in stage. -You can change the lead very easily and in seconds. The lead is not glued it fits with precision into the gimmick. -Perfect flesh color that makes it absolutely invisible. -Can be used for close-up stand up or stage conditions . -Designed and manufactured by professionals for professionals. -THEY ARE SPECIALLY MADE WITH THE FAMOUS “VERNET THUMB TIP” MATERIAL.